The Kansas City metro’s employment performance since 2001 has been meager at best and downright dismal at worst. We have told this story many times over the past few years here at KCEconomy. New data from the Quarterly Census of Employment and Wages shows us a hidden and surprising story. 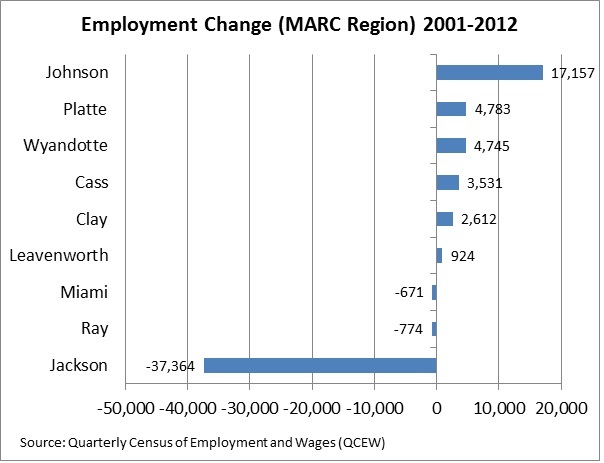 The chart below shows that Jackson County lost the most jobs — more than 37,000 — between 2001 and 2012. 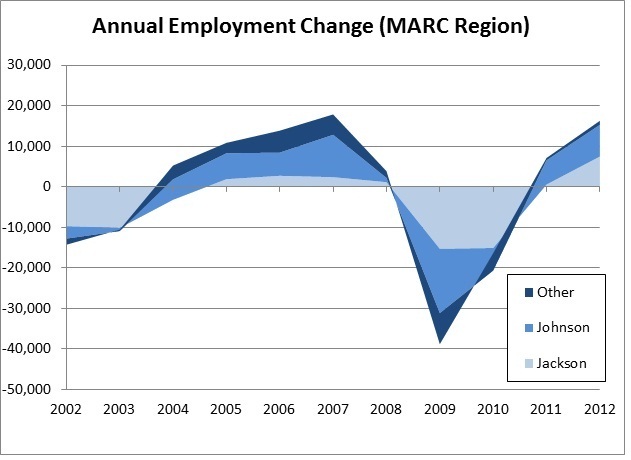 Even with employment gains in other counties, the MARC region as a whole lost about 5,000 over this period. The employment decline in Jackson County was not consistent over time. In the chart below, we see annual employment change broken down into three geographies: Jackson County, Johnson County and the remaining counties. These three regions are roughly equal in size in terms of current employment. The overall pattern is understandable. We had an employment decline after the 2001 recession, followed by a recovery where local employment growth was slow at first (2004-2005) and picked up steam in 2006 and 2007. The bottom fell out during the great recession in 2008–2010. A slow recovery started in 2011 and gained momentum in 2012. Looking at the separate geographies, however, a few things stand out. First, Jackson County suffered the bulk of the employment decline during the 2001 recession. Second, Jackson County only saw modest employment gains between 2004 and 2007, while growth in the rest of the region was more robust. The employment loss during the Great Recession was felt throughout the region — Johnson County actually lost more jobs than Jackson in 2009 — but the substantial declines lasted well into 2010 for Jackson County while they abated in the rest of the region. On a positive note, employment growth in Jackson County kept pace with Johnson County in 2012. So what happened in Jackson County over the past decade? Breaking employment losses down by industry provides some insight. Since 2000, the Information sector has had the greatest decline. Information is a broad category that includes telecommunications and publishing, which have both seen declining employment for quite a while. In 2001, Jackson County had more than 25,000 of these jobs, but this figure has dwindled to fewer than 10,000 today. In the early 2000’s some of this decline could have been Sprint employees leaving downtown offices as the Sprint Campus was filling up. This doesn’t fully explain the overall decline, though, when you consider Johnson County also experienced a dramatic decline in this industry since 2001. There is also a well-documented “economic border war” going on between Missouri and Kansas, but it is difficult to get accurate figures to gauge how much of an impact the relocation of businesses within the region has had on Jackson County employment. We will have to dive down further into the weeds to try and find some definitive answers to this question.